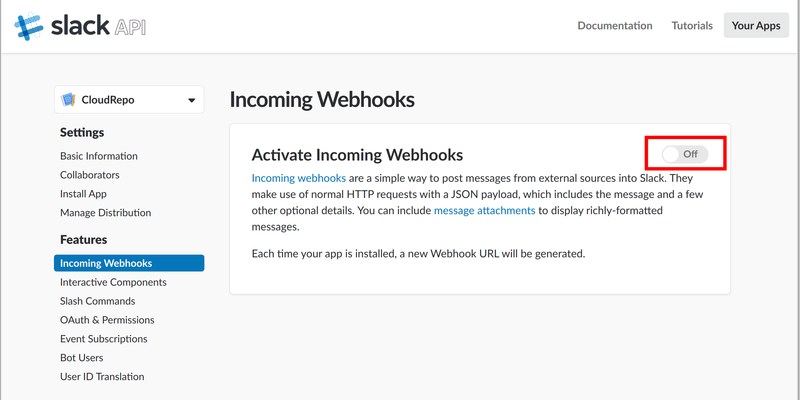 If you need additional webhook support, please let us know. CloudRepo can be configured to send an email notification whenever a file event happens in your repositories. 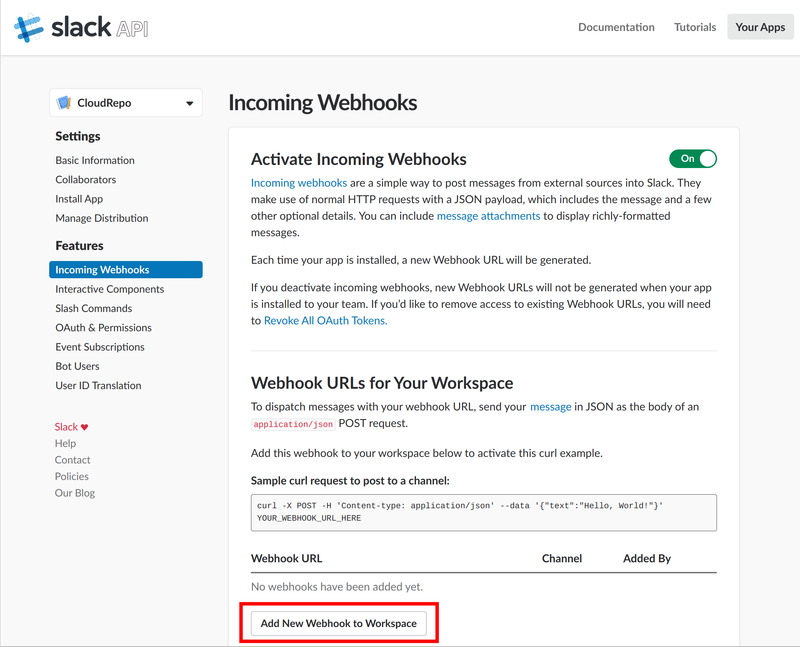 Jump to Creating a Webhook to get started. 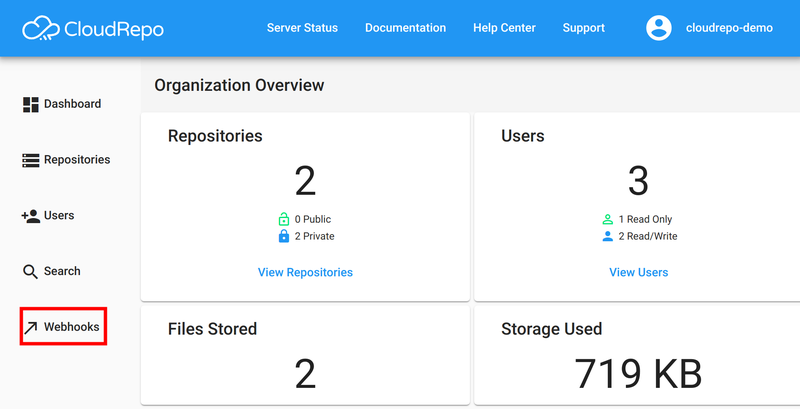 CloudRepo can be configured to POST a JSON payload to an HTTP endpoint whenever a file event happens in your repositories. This section details how to setup CloudRepo to fire events into your Slack channels. 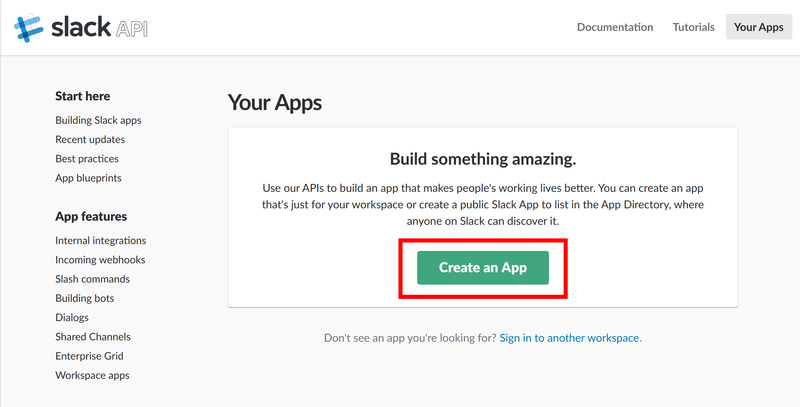 First, navigate to the Slack API Access and sign in. 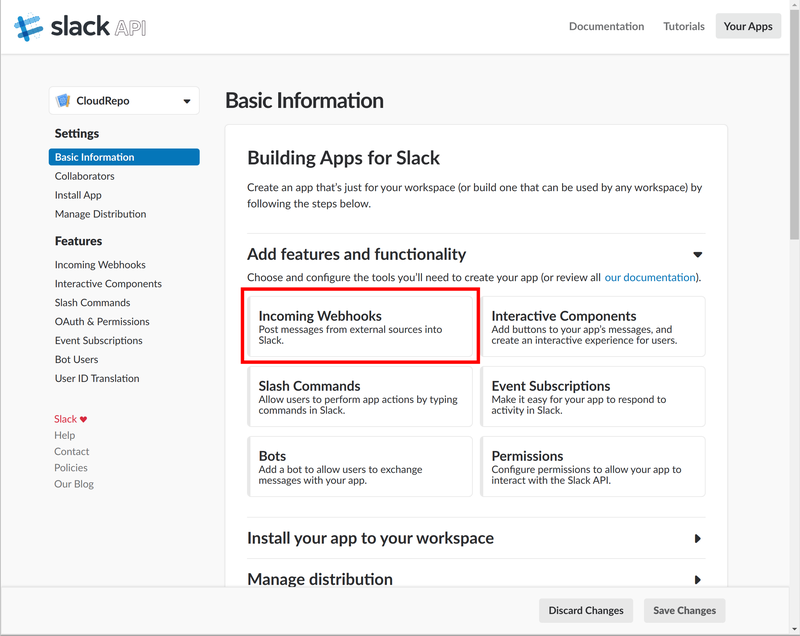 Once your Slack Workspace App is created you will need to activate Incoming Webhooks for your workspace. Upon successful authorization, you’ll be sent back to the Webhooks Configuration screen. 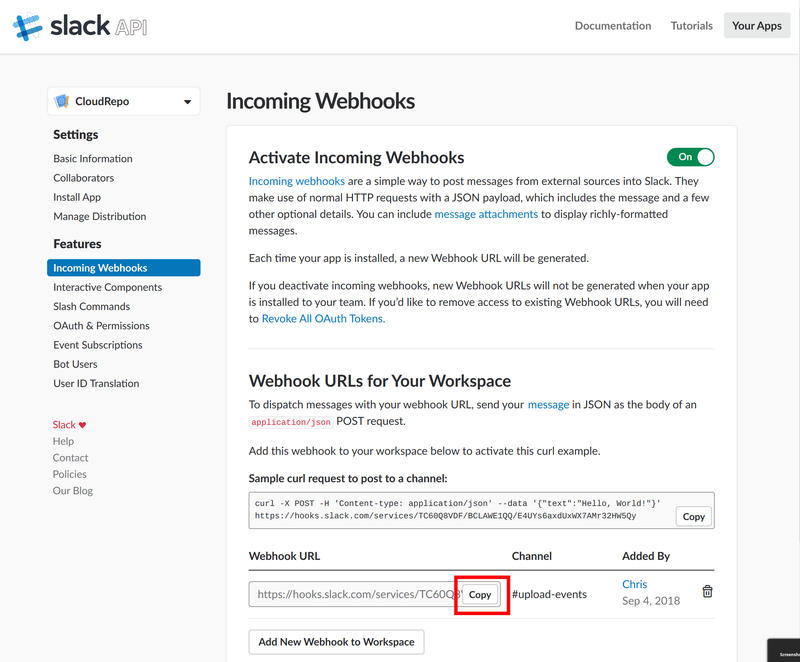 Your new webhook will be added and you will be able to copy the URL into your clipboard in order to add it to CloudRepo. 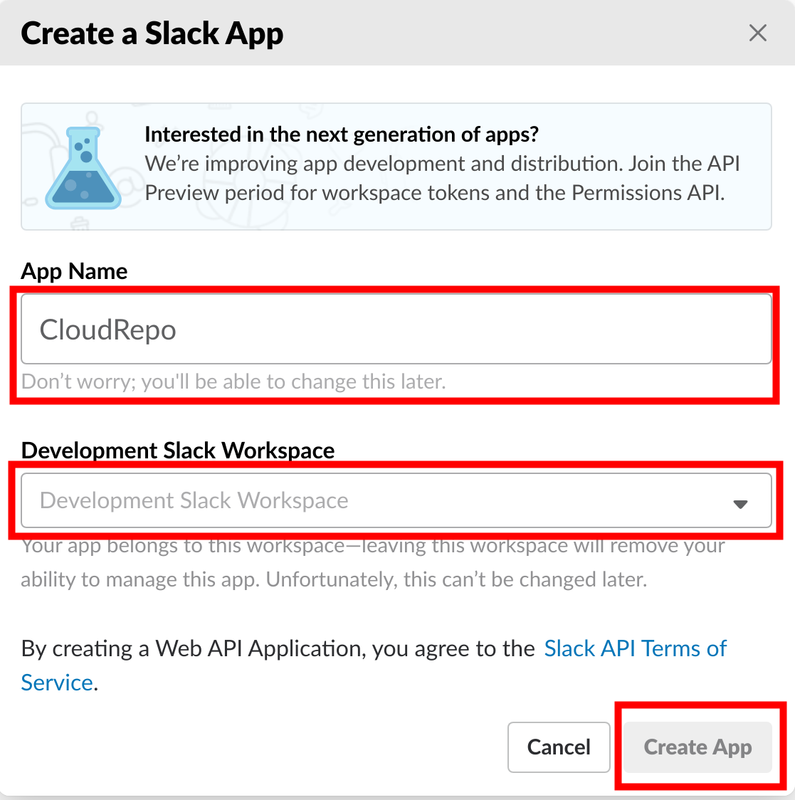 Now that the Slack Webhook has been created within Slack and added to your Slack workspace, you’ll need to login to the CloudRepo Administrator Portal. First, you’ll need to login to the CloudRepo Administrator Portal. You’ll be presented with the list of webhooks. If this is your first webhook, the list will be empty. The webhook will fire for events that occur within this repository. Email: Type the email address you wish to send notifications to. JSON: Type the Webhook URL that will listen for an HTTP POST with an HTTP JSON body. 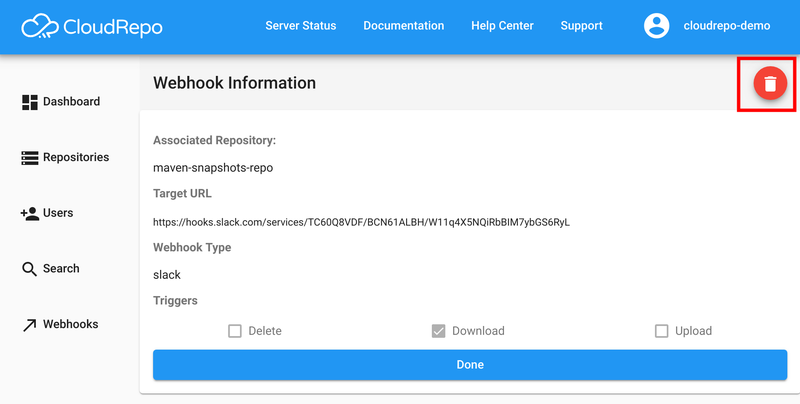 Slack: Paste the Webhook URL that you copied from the Slack Webhook Configuration Page here. Select the events you wish to be notified about. At this time, CloudRepo doesn’t support modifying an existing webhook. 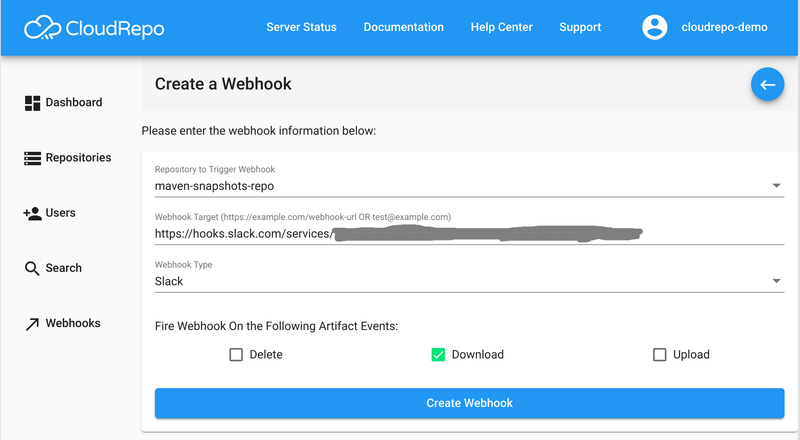 If you wish to add events to a particular webhook URL, simply create a new webhook with the additional events you wish to monitor. If you wish to remove events from a particular webhook, delete the existing webhook and add a new webhook with the updated permissions. A confirmation window will pop up, confirm deletion and the webhook will be permanently removed.